Located in the Historic Valley Junction in West Des Moines, Heart of Iowa Market Place offers opportunities to sample, share and remember Iowa with distinctly Iowa gift items and products. As much as the products themselves, it is the experience we deliver that keeps our customers coming back and leads them to tell their friends and family about us. The Heart of Iowa is a place where customers can refresh and explore; a place reminiscent of a time when the pace was slower, the family were near and neighbors were friends. We specialize in Iowa gift baskets, gourmet foods, souvenirs, John Deere, Iowa Hawkeye and Iowa State gifts. We are a key resource for gift items that are “All Things Iowa”. We take great pride in designing every gift box or gift basket with personal attention to detail, creating each one to convey the special message or sentiment you wish to share. As a family owned business, we are small enough to meet our customer’s special requests, yet large enough to accommodate any company’s large corporate gift needs. We offer shipping to U.S. recipients through UPS. Des Moines area delivery is also available. Rose Breuss, Director of Marketing – McGowen, Hurst, Clark & Smith, P.C. Kelly Sharp an Iowa native lives in Downtown Des Moines, along with her husband Denny and dog Annie. They have four children, Ryan, Cory, Abbra and Josh and granddaughter Mia. One of her great passions is her dog Annie and horse Aria (From the Heart), along with biking, running and spending time with her family and friends. Kelly worked for over 25 years in marketing, business operations and retail and always hoped to one day own her own business. 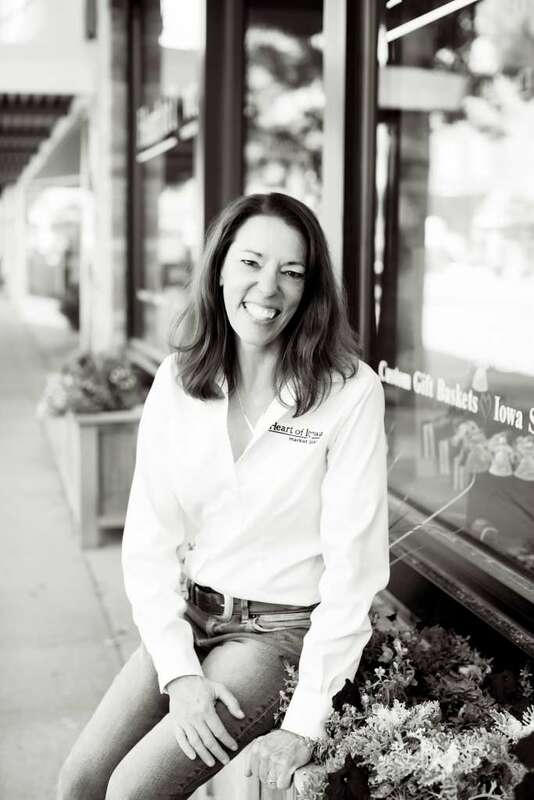 In 2011 she realized this dream with the purchase of the Heart of Iowa Market Place. Wisconsin transplant Abby Rodewald joined the Heart of Iowa team in March of 2017. Abby moved to Des Moines in 2012 after graduating with a Bachelors in Landscape Architecture degree from Iowa State University. 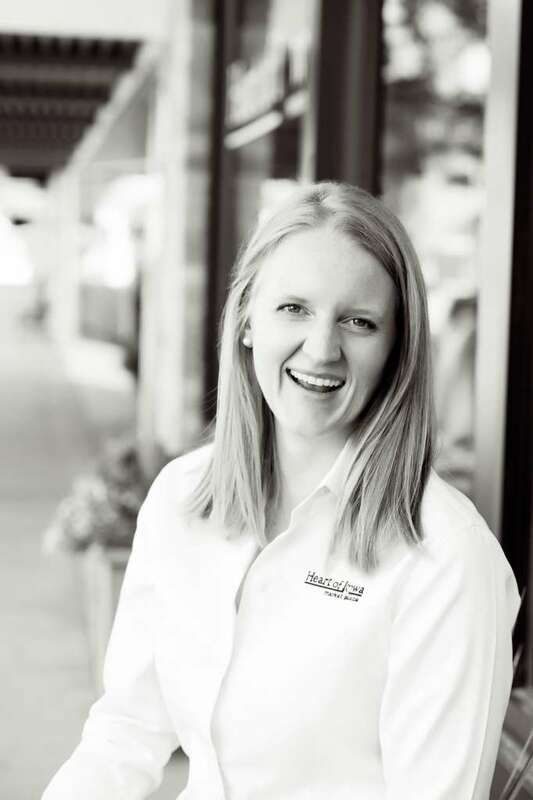 Abby loves being active in the community where she currently serves as the President for the Young Professionals Connection. In her spare time, Abby enjoys being outside, whether it be biking, running, hiking, or taking her white lab, Emma, to the dog park. “I’ve lived here quite a while now, so I know the pride that Iowans have in their state is something that really shines through. I also know what a unique opportunity it is to manage a venture as special as the Heart of Iowa Market Place”. Iowa native Shelby MacLeod moved to Des Moines in 2015 after graduating from the University of Northern Iowa. 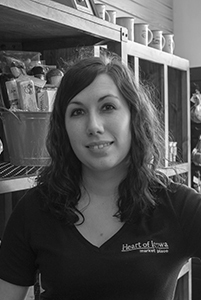 Having always loved the world of small-business retail, Shelby joined the Heart of Iowa team full-time in October 2018. In her free time, she enjoys reading, being outdoors, and spending time with friends and family.